Now I'm really getting into the meat and potatoes of Essie's Luxe Effects; we've seen my variations and inspirations with Shine of the Times and Pure Pearlfection. I've worn Butter London's Fairy Lights alone and while pretty and even somewhat striking; however, it really needs an added oomph. 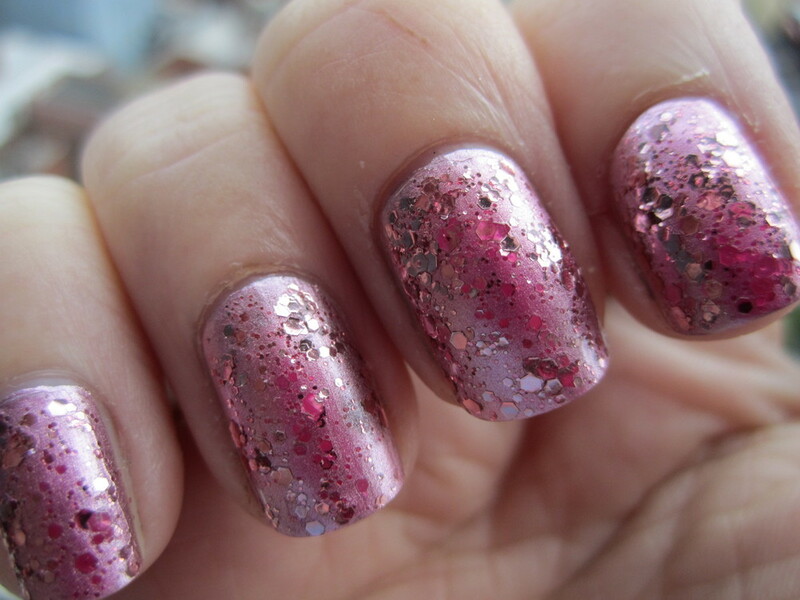 The grey undertones of this pink fall flat and can even make my nails look dirty and what person wants that? Just by adding one coat of Essie's A Cut Above, I've gone from blah to PJ Sparkles circa 1989. PJ was my prized possession at the young age of six-years-old and quite frankly, they don't make toys like they used to. I definitely relived my childhood this week. Some might find this look to be a bit manic, but I find it to be funky. When executing this look, opt for an industrial strength top coat in order to really seal in the larger pieces of glitter; if I hit my nails against something at just the right angle, the glitter had a tendency to pop off. A Cut Above and Set in Stone give similar shades a 3D effect - it's almost as if beads of water are dripping off of my nails, that, or diamonds.